At IRMCS, we understand your business needs. Our user-friendly multi-channel Retail Systems enable you to tackle business challenges quickly, accurately and at an affordable price. Armed with two decades of experience in deploying cutting-edge management software solutions for retail, distribution, and POS for diverse sectors, our keen industry insights have helped build successful retail businesses that thrive on efficiency, profitability and customer satisfaction. Let us partner you in creating a feature-rich and integrated management software solution for your precise business needs. Forget about min/max and work on real-time stock modelling with Aralco's Auto Purchase Order - it is an amazing stock replenishment systems ! I love Aralco’s Reporting Systems – who bought what, when and where ? Aralco's customer support is the best I’ve seen in business software - always friendly and fast to respond, especially in the odd times we have made errors that caused store panic. I would recommend Aralco to any growing business that requires options. It’s seriously flexible and their company will work with you without breaking your budgets. Aralco is able to give us the real-time information we need to run our grocery business with its powerful and user-definable reporting systems. Its on-line infrastructure also allows us to respond very quickly across multiple stores and is ideal for chain store operations. We would recommend IRMCS whose team has been highly responsive and knowledgeable in Aralco Retail Systems. Aralco has delivered operational efficiency from the back office to our front POS, and its comprehensive reporting module is an exceptional power tool for us. Ever since we changed to Aralco in 2015, our team has seen lots of improvements allowing us to stay on top of everything, from back office to our retail space. I would strongly recommend Aralco Retail Systems because it is always evolving to meet our new challenges. Aralco has enabled us to activate our Point of Sale system easily and effectively enabling us to handle large volumes of business in a short amount of time efficiently. The easy to use interface has been adopted quickly and is a powerful tool for data analysis and member management. We highly recommend Aralco for your organization! We, at KOMART are very satisfied with the smooth and steady progress in our business relationship with Aralco for more than 9 years.The results to date say a lot for the quality of work being offered by Aralco. Therefore, we recommend Aralco as a high calibre provider for a wide range of inventory management and POS system requirement. We need to know what is going on in each of our stores in order to stay competitive. Aralco's system is powerful enough to do that for us. We’ve been working with the Aralco system for many years and have grown from 2 stores to 5 stores. Have we had any growing pains along the way? You bet, but MJM and Aralco have worked together over our 7 year relationship to solve them, which at the end of the day is all you can ask for in an important business partner. We are delighted with Aralco. Their support and training has been exceptional. They are prompt, professional and we love the fact that they can log onto our systems when necessary to fix problem. 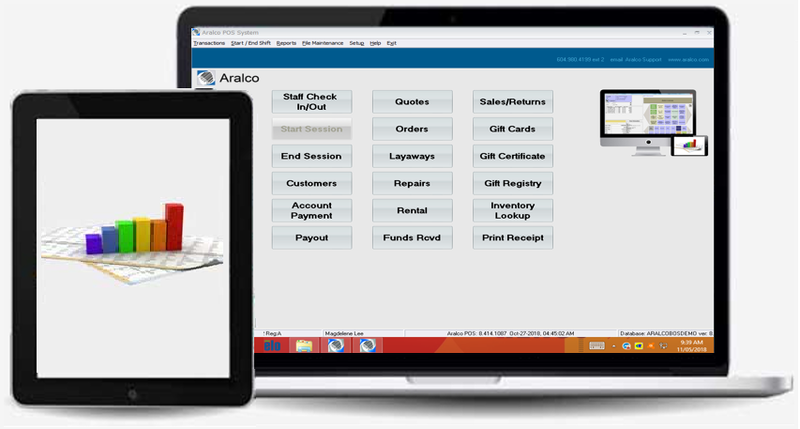 I would definitely recommend Aralco Retail Systems to any business looking for a feature-rich point of sale and inventory control software. It’s a positive addition to any retail environment. We are very impressed with the flexibility and willingness to adapt that the Aralco development team has demonstrated. We remain strong endorsers of this Company. 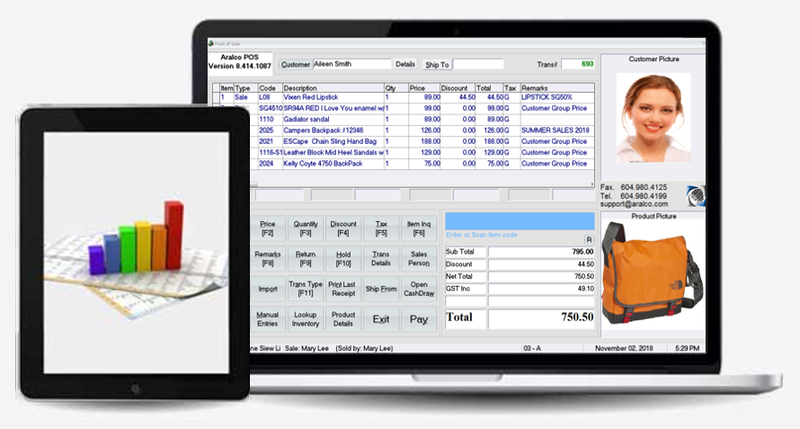 It’s way more than just an Automatic Purchase Order System. It’s really a Demand Forecasting System that allows us to create automatic P.O.’s on intelligent data. Aralco has been a saving grace. With inventory management in place, we can now focus on training our staff and serving our customers. Aralco is the foundation of our business. I know I will get the support that I need. I don't want to deal with a company where I have to call an 800 number and hope that the person answering can help me. With Aralco, I'm dealing directly with the people who created the software. That makes me feel very secure. A significant area Aralco stands out from its competitors is in its after sales service and support. It has always been quick, friendly and all issues get resolved. They understand the urgency of a business to get the issues resolved in a timely manner and have never let us down. The reports coming out of Aralco are EXCELLENT, the POS side works great - the store guys love it! The commitment, service, and advice provided by Aralco support team exceeded our expectations. I would recommend Aralco to any small-to-medium-sized retailer who is looking for a solution that will meet and deliver immediate results. Aralco has been our software provider since 1992, and we have forged a really close relationship over the years. I would recommend Aralco to any retail business, whether they are new or just looking for a change. We have basically built ourselves around the POS software system. We couldn't have made the leap to a second store and kept growing without Aralco. Finally, a system that does what it says it is going to do ! Aralco Retail System meets all of our needs, but they are constantly reaching for more. I am really happy about that. We felt it was very important to partner with a company that really cared about us and would be willing to help us in our desire to grow and thrive. Aralco has a product to be proud of ! Barkers Park's first day opening was a huge success and exceeded expectations, even though our staff had only 10 minutes of POS training. Many thanks to the team at IRMCS and Aralco who pitched in to make it happen. Powerful yet flexible, the Aralco Retail Systems is designed to perform in every capacity, from large multi-store networks that house multiple POS registers using local area networking to simple single-POS store operations communicating real-time via the Internet with the central server located anywhere in the world. click on any of Aralco clients below to view success stories and testimonials.